"They provided excellent service. It's a human factor, they are not robots. They tell it how it is and help you understand what is going on." They provided excellent service. It's a human factor, they are not robots. They tell it how it is and help you understand what is going on. I like that they are honest, and pleasant to work with. They were timely and gave me a ride to my office, they were very, very friendly, and the price was right. They have done all my work for the past 15 years. He has fair reasonable prices. I have been going there for many years and they have always took good care of me. They're a great place to go, very friendly, nice, and helpful. They know what they are doing. It was the most expensive lube and oil change I have ever had. He knows what he is doing and he's honest. I know he is going to do the right job every time. He knows his product more than anyone I know. I have went to them multiple times and they charge fair prices. Sometimes they fix things for free. They told me everything that needed to be done. They were efficient. They picked me up and took me up. What more do I want? They got us in quickly, right on time with our appointment and the price was reasonable. I have already recommended them. Pat is very knowledgeable and explains everything in detail. Even with the regulator problem, he didn't talk at me like I was a girl like other mechanics do. I take all my vehicles to them because I have no problems. His prices are economical and his work gets done in a timely manner. I'm just very satisfied with them. I find them to be reliable, timely, and cost effective. Pat's Automotive of Santa Maria has been providing the local community with exceptional quality automotive repair since 1985. Pat Nicoll, the owner, is a very sincere gentleman who is committed to providing the local community with honesty and sincerity above all else. This commitment was confirmed in our unbiased review of their most recent customers who describe this team as excellent, courteous, reasonable, and professional. Pat employs a team of professionals who work hard to maintain their ASE Certifications and attend the ongoing training it takes to perform professional, fixed right the first time, repairs on your modern vehicle. These repairs range from California Smog Check, to check engine light diagnosis and repair, to wheel alignment, to minor and major mechanical repairs, as well as your scheduled maintenance needs. This work is backed by a 24-month / 24,000-mile warranty for your peace of mind. Local shuttle service, rental cars, early bird drop off, and a waiting area with wireless Internet are available for your convenience. 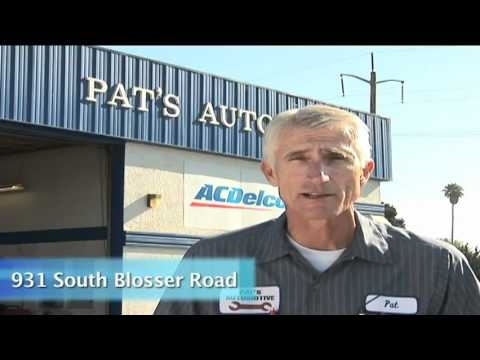 Pat Nicoll and his wife Patricia opened Pat’s Automotive in 1985. Since then the business has grown to become the largest and most respected independent auto service facility in the area. We take pride in our clean, well-equipped shop and we have access to the most complete database of high tech service information in the industry. All of our technicians are ASE certified and attend update classes regularly. We are committed to offering our customers the absolute best in auto repair and service. Our attention to detail and personal service set us apart from average shops. We service all domestic,Japanese cars,light trucks and RVs. Our work is guaranteed a minimum of 12 months or 12,000 miles.